The Indianola Volunteer Fire Department honored me Saturday with a surprise presentation and naming ceremony christening tender 18 "Big Jim". 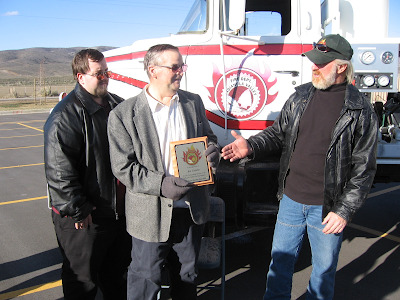 I was also awarded a wall plaque on the occasion by Chief Kent Higgins. 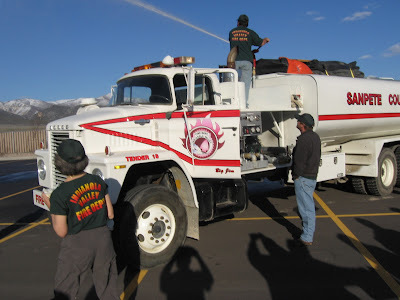 Members of the Sanpete County Station 18 Indianola Volunteer Fire Department attended the presentation and demonstrated operations of newly refitted "Big Jim" with the monitor, and some spectacular displays of water output capacity from tender 18 pumps. One thing seems quite obvious to me, and I hope I speak as well for all who are volunteering efforts of thier time and talents at station 18. This award is a little recognition all our good efforts and teamwork. I certainly would have been lonely driving that big 'ol truck around by myself all the time, but fortunately, there was never any lack of willing partners and "good buddies. Tihough we sometimes make jokes about it, freindship and brrotherhood mean the world to me, fighting fire, or working in the station on yet another boring exercise. We had a chance to learn about a bit more than "put the wet on the red"
One of the the interesting and significant things about my involvement in the department is that it has been a family tradition for generations since Cobabes lived in this county to volunteer for service to the community. Fredreich Wilhelm Cobabe, a German immigrant and my great-great grandfather, was also a vounteer fireman in his day, and served in the Ogden City Volunteer Fire Department for many years, both as firefighter, and as the secretary of that organization, and as a member of the band the fire department manned and performed with for many years, primarily to raise funds for charity causes. above: Five generations of firefighting in Utah, represented with Jim's grandchildren Katelynn and Christopher aboard the cabin of Tender 18 "Big Jim" as Graciella demonstrates the enineersn role , and Jim's son Jimmy handles the operators position. above: Shirley Macintosh looks on as IVFD volnteer firefighter Robert Beale demonstrates operation of monitor gun on newly refurbished and rechristened tender 18 "Big Jim". Very cool, Jim. And I must say, you hardly look like "Big Jim", you should post more photos of yourself. You look great! Congratulations on the recognition by the fire department. As you say, it's nice to be recognized, and even nicer that you, yourself, recognize it as a total team effort. Congratulations, again. Jim, I didn't know that about Cobabe firefighters! You need to get all of your family history knowledge condensed to one place, and print it out or something - I would love to know all the stories you know. It would be great to publish a book for the family, and nobody writes more beautifully than you. This summer we'll have to go see Big Jim, my girls will think you are a celebrity!